Daisy is made from a black material with a white face, white inside her ears and a white patch on her back. She has black button eyes and black stitching for her nostrils. She has curved, beige coloured horns on top of her head. What a way for your day to begin! Daisy was released on 25th June 1994. Her birthday is on 10th May 1994. She retired on 15th September 1998. Daisy was given away at the baseball match between Chicago Cubs and St. Louis Cardinals on 3rd May 1998. 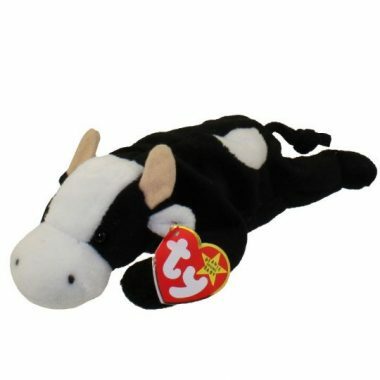 There were 10,000 Daisy Beanie Babies were given away.